It’s Professor ‘Twitter Girl’ now, thank you very much – Shawna Malvini Redden, Ph.D. I tried not to be offended when he ran out of class in the middle of what students usually describe as the most engaging lecture of the semester. When he came back awhile later, his smirk from the back row unnerved me. But I shrugged it off, avoided his gaze, and finished my talk. I’d been telling the story of Southwest 812 and my hole-in-the-roof emergency landing experience. I use the story to teach Weick’s organizational sensemaking and how we collectively make meaning of events relative to our identities, social experiences, and external cues. When I got to the part where I’d landed safely in Sacramento and was barraged by news crews asking if I was “Twitter Girl” (for the photos I posted to Twitter which broke the story around the world), he realized his professor was the person he and his Army buddies made fun of in Afghanistan years ago. 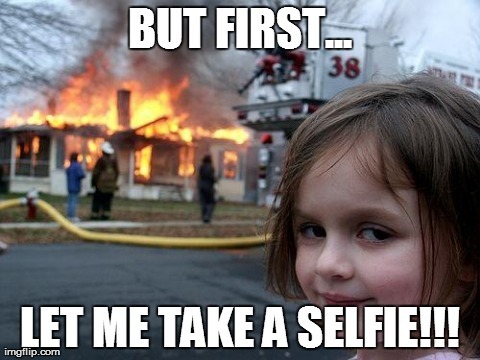 For the record, there were no selfies taken during the emergency landing! But I am one of those idiots who will post about scary experiences online and now, just after the fifth anniversary of this April Fool’s Day experience, I realize the story will never die. Because I told it on Good Morning America and a pack of other news outlets hours and days after. Because a year later, I gave a Discovery Channel interview (that still airs around the world and inspires strange men to reach out to me on Facebook). Because two years later, I flew to Germany to reenact it. Because three years later, I talked to Time Magazine. Because four years later, I published a scholarly article about it and oh yeah, Ellen DeGeneres made fun of me. And now five years later, I realize at least if it doesn’t die, it will continue to serve as a beautiful example of sensemaking when I’m teaching organizational theory.